Like Kappa Corona Borealis, HR 6817 (known only by catalogue numbers) used to be a much hotter class A star, showing that such stars -- which are more massive than the Sun and frequently have surrounding debris disks -- also have real planets to go along with them. The lower circle shows the location of the class K giant HR 6817 Draconis (in the constellation Draco). The planet orbits the star every 416.1 days (1.14 years) in a nearly circular orbit that averages 1.3 Astronomical Units from the star, not that much farther than the Earth is from the Sun. Since we do not know the orbital tilt, we can measure only a lower limit to the planet's mass, which is at least 1.6 times that of Jupiter. HR 6817 Draconis is a sixth magnitude (5.95) class K (K1) giant star 163 light years away with a temperature of 5010 Kelvin, a luminosity 11 times solar, a radius 4.4 times solar, and a mass 1.6 times that of the Sun. A projected equatorial rotation velocity of 1.5 kilometers per second leads to a rotation period that could be as long as 146 days. Rather than being a helium-fusing giant, however, it seems more to be a subgiant, a star with a helium core that has not become hot enough through contraction to have fired up to fuse to carbon and oxygen, and as such is just beginning to evolve into a true giant. The metal content is just barely greater than that of the Sun. HR 6817 is also moving fast, 67 kilometers per second relative to the Sun, some five times normal, suggesting that it is a visitor from a different part of the Galaxy. 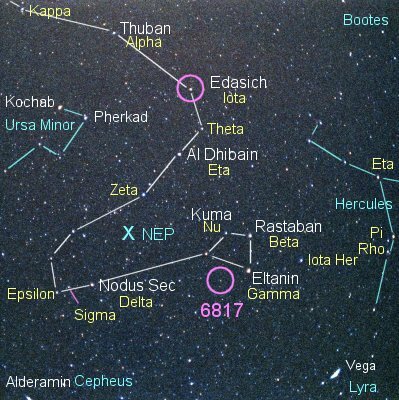 Edasich (Iota Draconis), the upper circled star, also has an orbiting planet or brown dwarf.